Where Clause….is used to filter results from SQL statements like Insert,Update,Select,Delete that meet the filter criteria. Similarly like above examples other operators like >=,<=,<> can also be used with WHERE Clause. ‘IN’ operator is used in order to fetch multiple values. 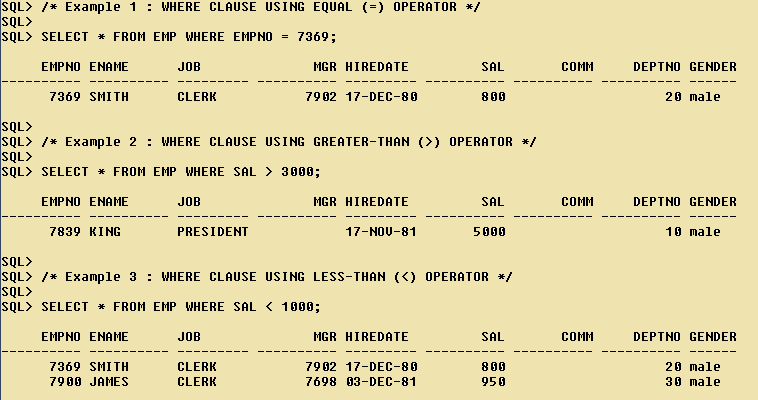 ILLUSTRATION OF WHERE CLAUSE USING ‘AND’ and ‘OR’ Conditions. Ques 1 : Display the employee number and name who are earning comm ? Ques 2 : Display the employee number and name who do not earn any comm ?